Robert Carrithers combines English language teaching skills with his creative talents and personal experience of the creative scenes in New York, Berlin and Prague, through writing, film and photography. Originally from Chicago, he has been initimately involved in underground music, art and club scenes going all the way back to New York in the early 1980s. He was a freelance photographer covering cultural events for various magazines and newspapers in New York, London and Paris. His book 'City Primeval New York Berlin Prague' was published in September 2017. A tale of three cities, the book shows how New York, Berlin and Prague influenced a number of artists and how they each influenced these cities. 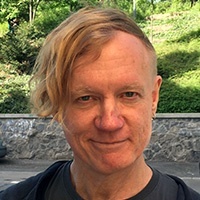 In 2018 Robert's second book was published by the Berlin publisher Pogo Books. It is called 'The Downtown Luminaries', and consists of his 1980s New York photographs.